Every night on the TV finance news, you’ll hear about the ups and downs of household name stocks, like the big four banks, Telstra, CSL, Wesfarmers, Woolworths, BHP Billiton and Rio Tinto. But the market is more than that handful of names. There are about 500 stocks in the All Ordinaries index, the indicator often referred to in the media as the benchmark for the Australian share market. The combined market value of those stocks, as of August 2016, was close to $1.8 trillion. Large cap stocks, such as the big stocks mentioned above, make up about 80 to 85 per cent of the total market cap. Currently, these are roughly the largest 100 stocks by size. The remaining 15 to 20 per cent of the market cap is represented by the small company stocks. Why would you want to include these often obscure companies in your portfolio? Well, there are a couple of reasons. One is that these stocks (known as small caps) tend to behave differently to the better known larger names, known as large caps. Sometimes, large caps will be the best performers. Other times, small caps will perform better. Owning both parts of the market means you are getting a diversification benefit. In other words, some of the volatility of being exposed to just one part of the market is reduced. A second reason for owning small caps in a diversified portfolio is that they are expected to earn a premium over large company stocks. Research shows this small cap premium (alongside premiums from low relative price and highly profitable stocks) is persistent across time and pervasive across different markets around the world. There are a few provisos to this finding. One is that the premiums are not there every day, every month or even every year. While we expect them to be there every day, there are periods when small caps will underperform large caps. This makes sense because if the premium was there all the time, it would be traded away. A second caution is that within small caps, other premiums are at play. Research shows that among small stocks, those with high relative prices (sometimes known as growth stocks) and lower profitability tend to have significantly lower expected returns than the rest. That means we need to take this difference into account in expected returns. Finally, diversification is critical. Over shorter periods, some stocks may do exceptionally well, others exceptionally poorly. It’s difficult to identify these stocks in advance. And that’s why you need a well-diversified portfolio that can capture the performance of these stocks in a more consistent manner. Diversification also helps control implementation costs which, if unmanaged, can be quite high for small cap stocks. 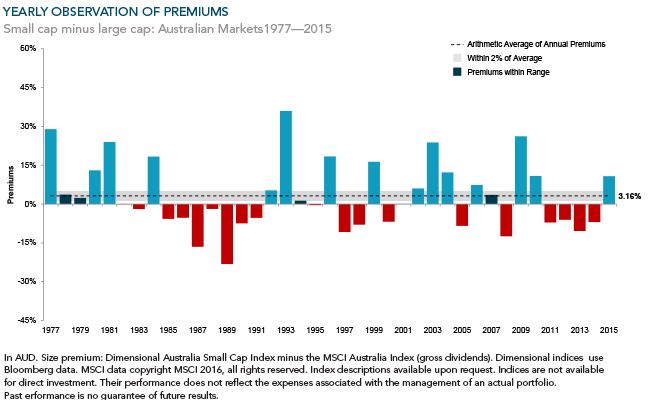 What’s been the long-term evidence of a small cap premium in Australia? 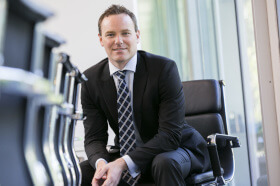 Over nearly four decades to the end of 2015, small caps here delivered annualised returns of nearly 14 per cent, beating large caps by around two percentage points per annum on average. The tricky thing for investors is the ‘on average’ bit. In some years, such as 1989, small caps significantly underperformed large caps. In other years, such as in 1993, small caps shot the lights out, figuratively speaking. Over the four-decade period shown in the chart below, you can see that only in four years has the performance of small cap stocks been within 2 per cent of that average premium. So the small cap premium (the difference between the performance of large and small cap stocks) can be volatile, which is the price you pay for earning the premium. In recent years, Australian small company stocks have struggled. In fact, in the four years from 2011 to 2014 inclusive, the small cap premium (as shown above) was negative. But does that give us any information about the future performance of small cap stocks or what might drive the performance in the years ahead? In other words, can we time the premiums available from small, low relative price and more profitable stocks? It would be nice, wouldn’t it? But rigorous tests show very limited evidence that we could do so reliably. That’s the bad news. The good news is you don’t need to be a timing wizard to get the benefit of these premiums. We’ve seen they are there over the long term. And we know that the best way to capture them is to apply a consistent focus within a broadly diversified portfolio. The nature of the small cap premium, however, is that when it does kick in, it can do so with a vengeance. And that’s precisely what we have seen in the past 12 months to the end of July 2016 as small caps (as measured by the same index as in the above chart) have delivered a return of about 18 per cent in the Australian market, well north of the flat result from large cap stocks. The big glamour stocks are not all that there is to our market. Small cap stocks also play an important role in your portfolio. They provide a diversification benefit because they behave differently to those big names. But they also offer an expected premium over time. The trick is riding out the volatility and staying disciplined within the asset allocation your adviser has chosen for you. How do I know if I have enough liquidity in my portfolio?